im plodding away, nearly finished My Alpha Vader sabre needs adding and fine work, colours etc..
and then its onto more white lol ! gee kurama your a painting machine!! a Fellblade AND a Knight makes me a bit embarrassed on my efforts, BUT also drives me too!! Edited by mithrilforge, 27 October 2015 - 05:08 AM. Just found I can charge my phone at the hospital!!! So it looks like I can surf the web while he's sleeping. So common guys and gals ... Keep me entertained with some amazing completions. Mithril that Vader is looking really good. Edited by SW1, 27 October 2015 - 08:55 AM. While I could say many many many things about this month, I'll try to keep it Warhammer related. Starting off the month around the 2 or 3rd I began painting on the Librarian from Space Hulk. He's had the bare head removed in favor of a helmet some weeks previous. 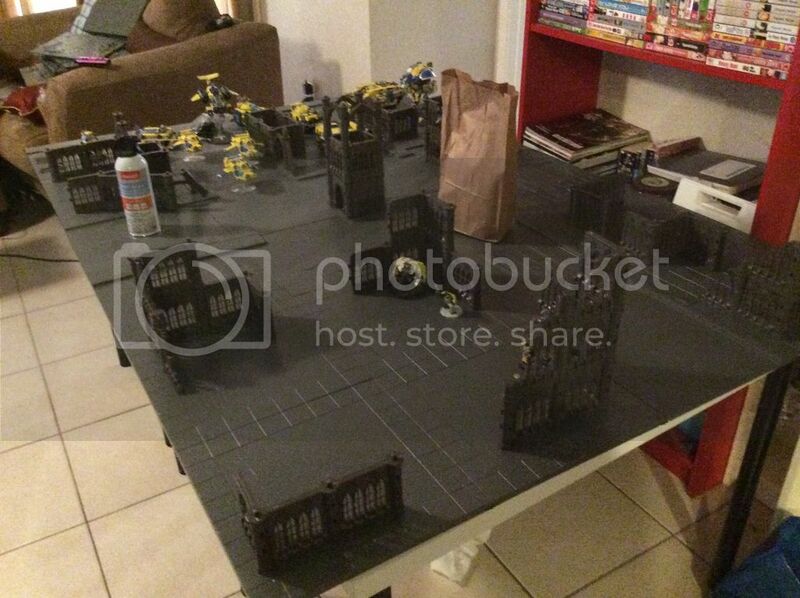 The photo also shows the parts and pieces for the Devastator squad to be. As with all things moving related I lost one of the weapon arms so I'm trying to decide what weapon doesn't get used and what to replace it with. I've joined the club of gamers with home tables! A trio of Secret Weapons Miniatures tablescape tiles will be part of my upcoming projects along with terrain pieces from Pegasus Hobbies. So for now I'll call this progress and hopefully by the time I'm back tonight I'll have some time to get a bit of work done, a bit of writing, and my share of comments from the peanut gallery on everyones work this month! I'm sadly going to have another failure this month. I've tried and tried, but I just can't gather up the motivation to get anything done. A lot of personal issues have come up recently, nothing severe (my thoughts go out to you, SW1), but enough to make me pause and reevaluate the priorities in life. The hobby is not as important as my physical and mental health, or the health of the people around me. I won't just disappear, but don't expect much in terms of production value. If anyone wants to take my position, feel free. I don't believe I'll have the time or energy to build and paint a 2,000 point army any time soon. Which is sad. I've been in the hobby for over a decade now, and I have yet to actually finish an army myself. 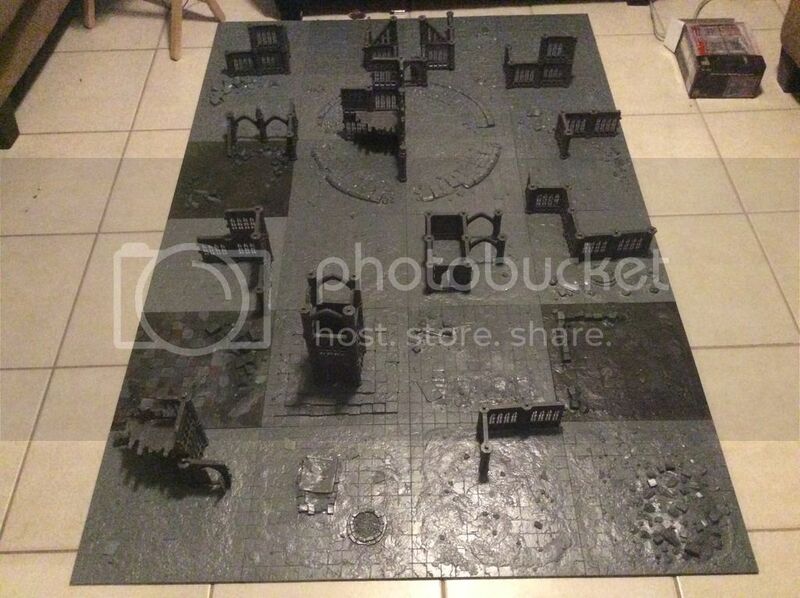 A few half painted ones, a few that I had people do for me, and lots and lots of unpainted stuff. I was truly hoping to finally get an army fully painted, built by me, painted by me. Sadly, not in the cards this time around. 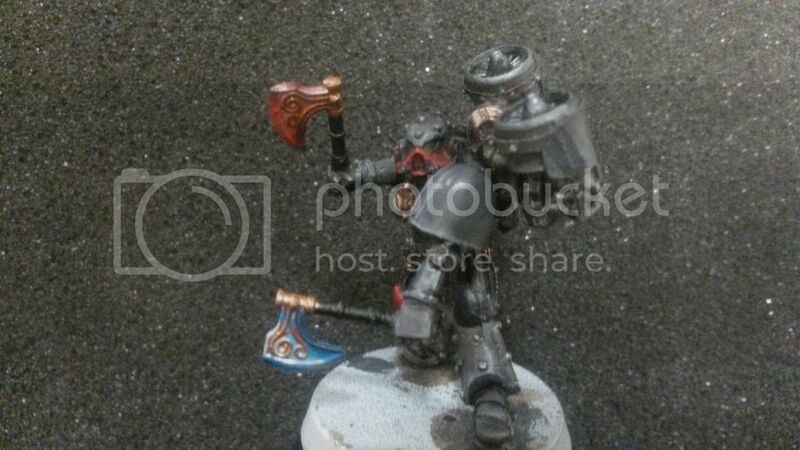 Light of Judgement was part of the 8th Assault Company of the Broken Scythe Chapter. 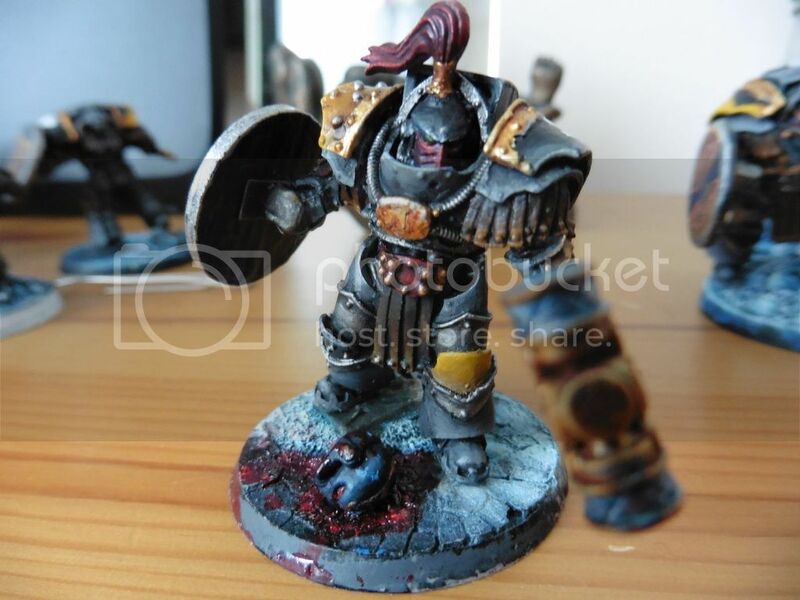 The 8th Assault Company was dedicated to clearing out the ruins of cities that had been bombarded by the Broken Scythes, and Light of Judgement was used to great effect in clearing out survivors hiding amongst the rubble as well as engagements against xenos such as the Orks. The Word Bearers believed that the fiery beam from this tank not only burned the bodies of their enemies, but also burned away the souls of the unworthy. As the Word Bearers fell to Chaos, the hull of Light of Judgement became more decorated with dark scriptures and runes. The crew was seen outside of the tank less and less, and although they talked little they mentioned soft voices heard within the hull. Eventually the crew took permanent residence inside the hull, and Diabolist Jareth who led the 8th declared Light of Judgement and its crew as favoured by the Gods to become one entity. During the Heresy, the machine spirit of the tank kept growing more aggressive. The runes and scripture on it were allowing warp energies to pervert and corrupt the machine spirit as well as fusing the crew into the tank itself. Their minds were kept mostly intact to allow communication and the ability to still pilot the tank. 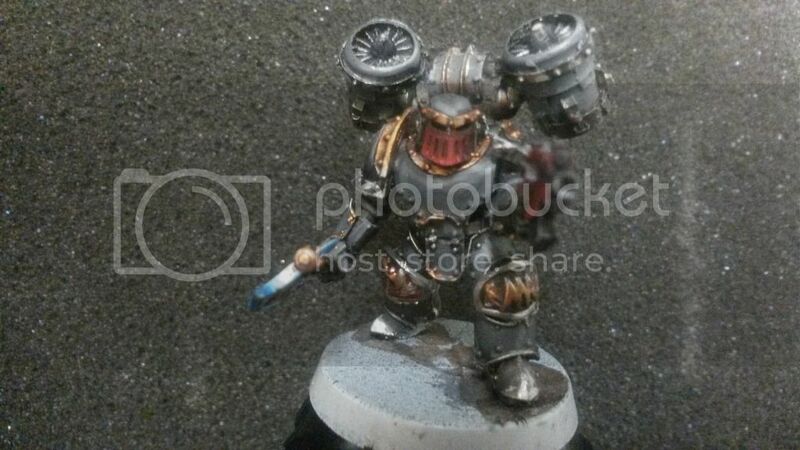 The voices from the warp combined with the increasing aggression from the tank’s machine spirit made them believe that it was their duty to deliver judgement to any who may be unworthy. Friendly fire incidents involving Light of Judgement drastically increased as the tank fired indiscriminately on large groups of enemies regardless of any Word Bearers in the area. The crew believed that the souls of their brothers would be found worthy and be left intact, and that the ends justified the means if it meant punishing the unworthy. Edited by Zujara, 28 October 2015 - 08:09 AM. 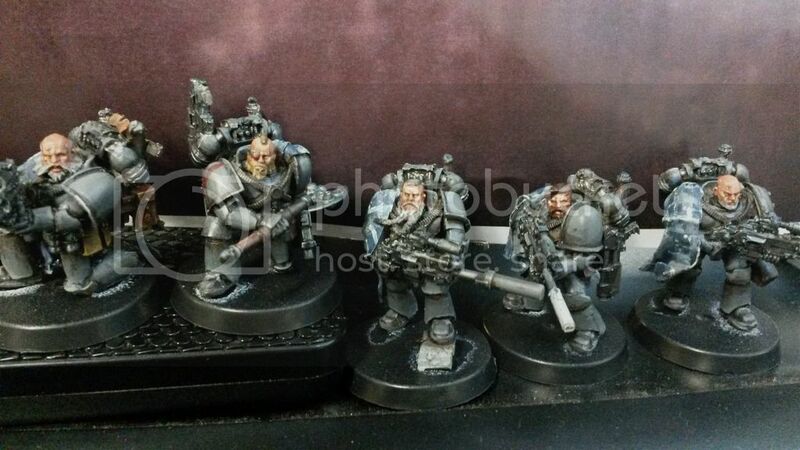 with the rest of the Librarius. and Hanging out with the Chaplains! So I'm not sure if I'm gonna try and tackle the devastators with the time I have left, and to be very honest I'm not sure if I'll be going back to them during this challenge, the tables call my name, as do the building for them, not to say anything of the other modelling projects I'm much more excited about (some proper servitors, an NDK, another TFC and an RQM, a Nephilim Jetfighter, some dreadnoughts and drop pods, A Stalker, a Storm Raven and the Storm Eagle). This week being what it is, I'm trading time by working primarily on my fluff, and comments will unfortunately come later. Dude thats fine it's more than enough. So 3 more days people. 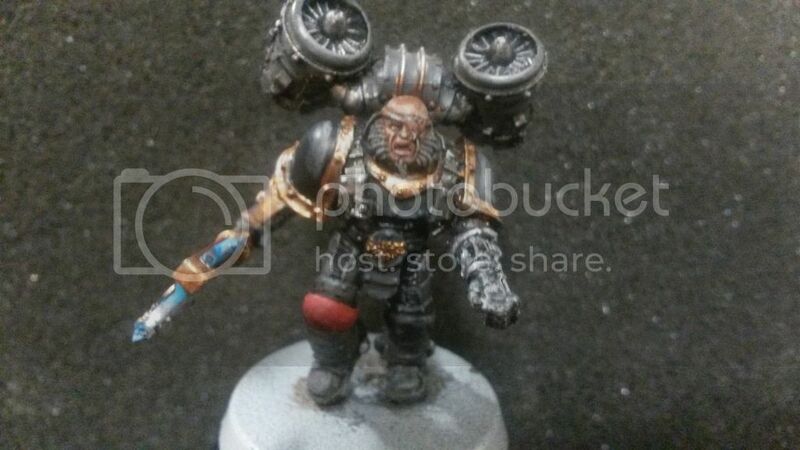 So its looking like I should get the Tactical Squad done and possibly the Rhino but not the Chaplain and Dreadnought. Surgery recovery took more out of me then I thought. Regardless there are no excuses in the Grim Darkness of the Far Future. 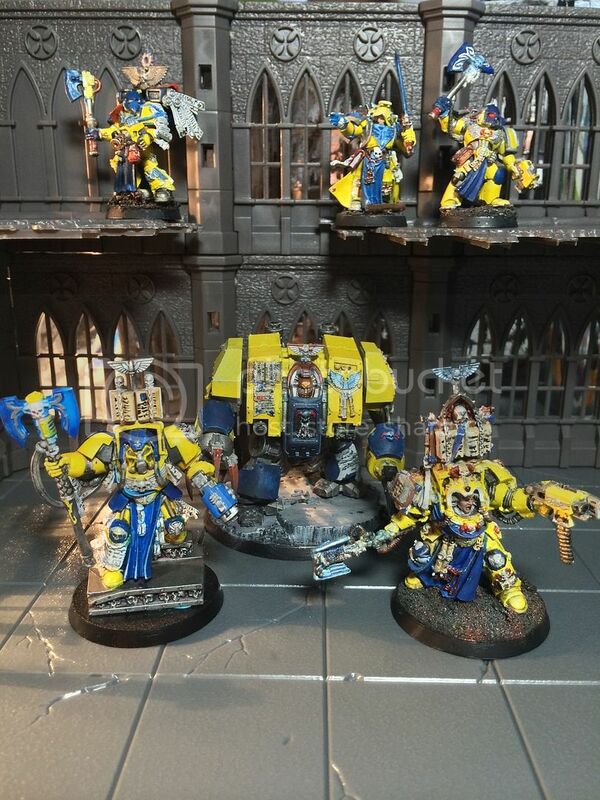 Next month will most likely be my hiatus month as I participate in NaNoWriMo (a novel writing competition for those wondering) but I hope to catch up with completing the Chaplain and Dreadnought as a break from writing. The lads home so I'm gonna catch up on sleep. His asthma is still requiring medication every 4 hours but his oxygen saturation levels are up finally. So they've let him home with a nurse popping in regularly to check his sat levels stay up. 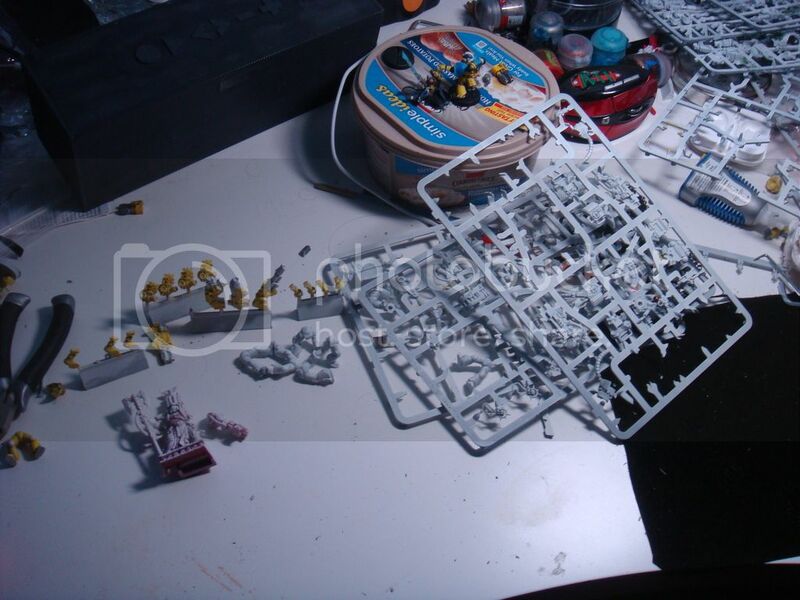 Should be able to do the last little bit on the Inquisitor. I've already got the fluff written so it's just the shoulder pads and backpack that need finishing. I may not finish the squad but of course will finish them during next months challenge along with the next vow! Come on guys there's been a lot of leniency on my part. Next month though will see some disqualifications if workloads aren't managed. Sorry man, there's just no chance whatsoever that I'll finish in time. Apparently, I'm the Aaron Dembski-Bowden of our Tale, the one true failure. I will redeem myself next month, though. By all the primarchs, I swear it! I truly appreciate your time and patience. I cannot explain my situation, but I will not be continuing. In fact, I will be taking a leave from the B&C. Situations and internet capability permitting, I hope to be back someday. Kurama, you've helped me see what I can do when I was able to make the time. I really thank you for that. The rest of you who can, KEEP GOING! You are all doing some really amazing and inspirational things. Thanks again for letting me join the ride. @ Rashbold - you will be missed... ,hope to see your work in these forums again soon. Ciao Brother of the Cog! Edited by Brother SP, 30 October 2015 - 03:06 AM. Don't know if I'll make it. My brothers been over and we've cracked on with his games board today. Working tomorrow and will be out of the house for 14 hours or more, with the same Sunday and Monday. Booked Tuesday off so likely she'll get finished then unless I get a second wind when I get in tomorrow night. Okay so with Month 2 at an end and me only finished part of my Month 1 vow I feel now would be the time for me to step out of the Tale of 18 Hobbyists. It wouldn't be fair on either myself or Kurama by pushing myself to a level that, realisticly, I should have known I couldn't achieve from the start. Rather then giving up, the Tale has inspired me to re-evaluate how I commit to my hobby. This, along with a string of failed challenges on the B&C has made me realise that, by trying to force myself to deadlines, I am self defeating myself by removing my enjoyment of the hobby. I am making painting a chore, rather then a hobby. 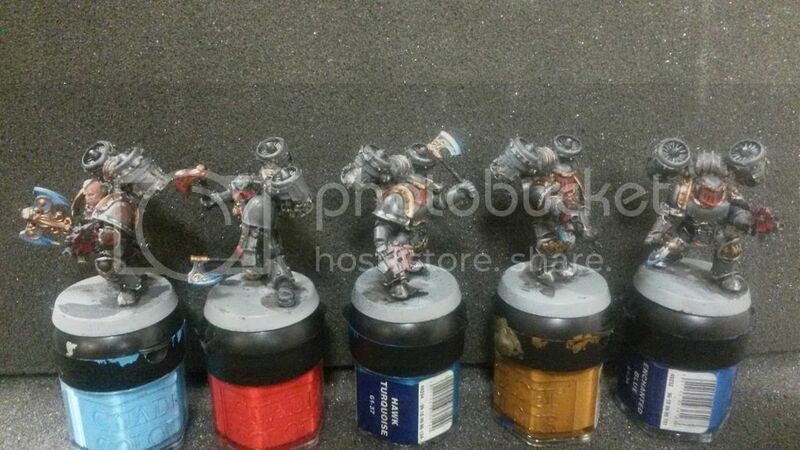 I still intend to keep working on my marines, indeed this rethink has inspired me to look at starting a WIP thread again, something I haven't done in ages and, more importantly, keep it up to date and post regular updates. I wish to thank you all for your encouraging words and help over the past two months, particularly Kurama for running the Tale and mithrilforge for his constant words of encouragement. I have failed for this month, as I did not get the Wolf Priest completed. Fluff will get done and posted along with WIP pics. These will get repaced with completion pics on the 7th when I return. 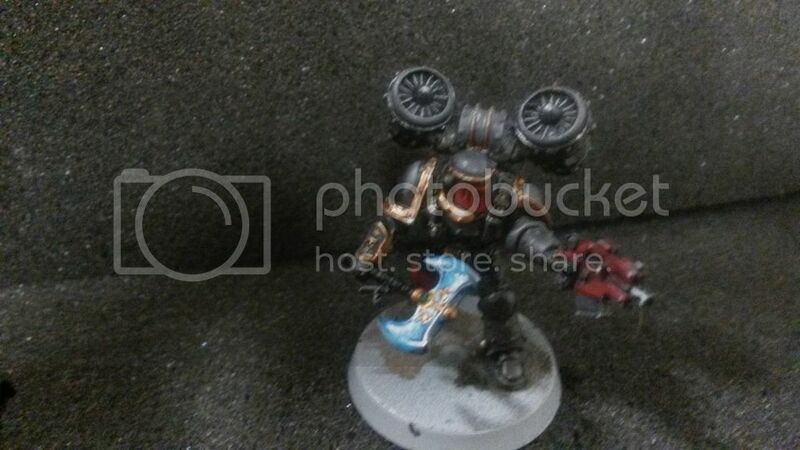 Next months vow will be the Wlf Priest Vykryl ad a Land Raider Achilles. Trying to keep it a bt more manageable. There's another 3/4 day of October 31st my vow will be complete! I got the fluff written up. It is a bit rough ad a bit WIPm trying to write up a fluff piece to g with some of my models That I have been working on. This is a bit rough and WIP, but I am quite happy with it. Let me know what you think. Completed model pics will be added at a later date, the 7th or 8th as they are at home on the digi-camera, and being on a rig where I can't get to them, so this month I will chalk up as a failure, even though to be fair I feel quite happy about what I have achieved so far. The ambush had been almost flawless. Almost…. Recon squad “Bjorn” sat in the cover of a burnt out hab building. The area had once been a popular trading district and there had been many shops, stalls and homes. Now it was deserted, the wares long gone or turned to ruin and the bones of unfortunate citizens were spread across the square, picked clean by carrion birds where they lay. It had been gruelling work, hunting down the traitors and many of our leads had been dead ends. Keldane Blackfox was always just out of reach. Hel-born scum. It took all of my restraint not to emit a growl at the thought and give our position away. Entering the plaza a lone Wolf stumbled and fell. He tried to rise, but failed & began a painful crawl across the rubble. Scant seconds behind him, followed a gaggle of cackling Night Lords. Having thought they had found easy sport, they took their time inflicting maiming wounds on the stricken Wolf who made no sound and could barely defend himself. It was only after the lead Night Lord examined their prey and discovered something amiss, that the trap was sprung. 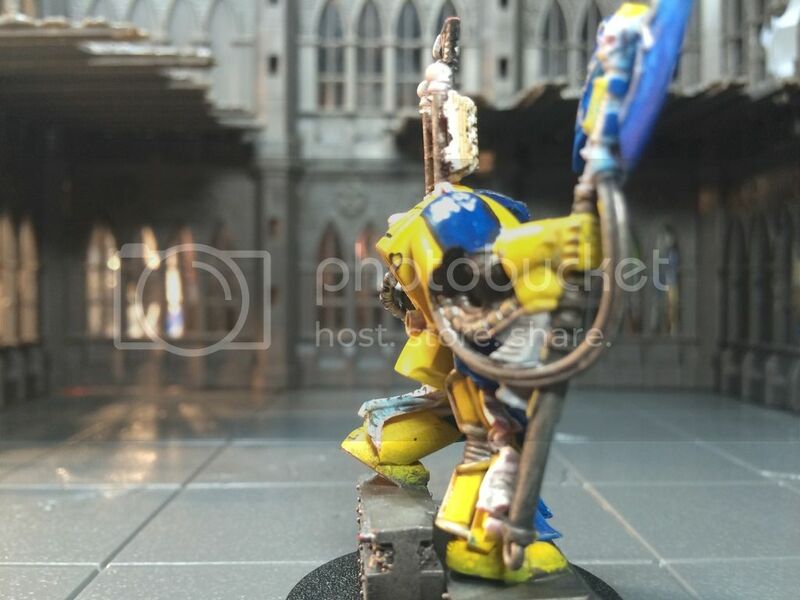 As the gore soaked, midnight clad marines looked around in confusion, Hjold Halfborn’s sniper rifle silently coughed and the closest Night Lord dropped. Then 2 more fell and they began to draw their real weapons and look for cover, not knowing from where they were being picked off. At a signal the sky blazed as grey clad marines dropped amongst their midnight brethren. 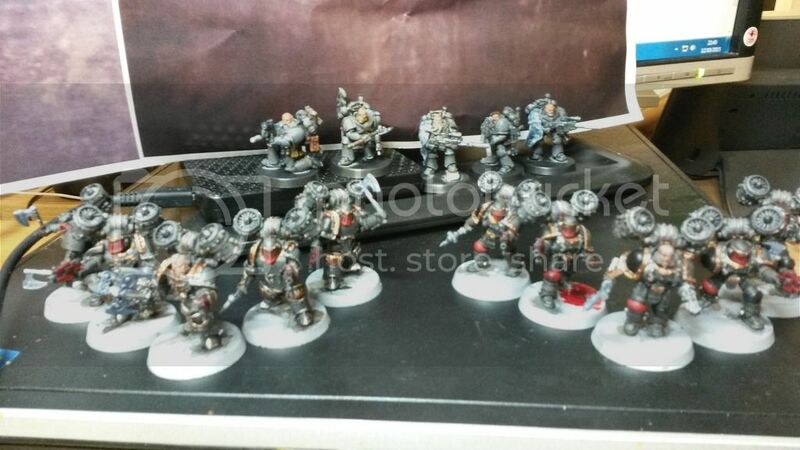 With glinting axes and barking bolt pistols, Kjaran Cold-heart led his pack into the fray against his once brethren. 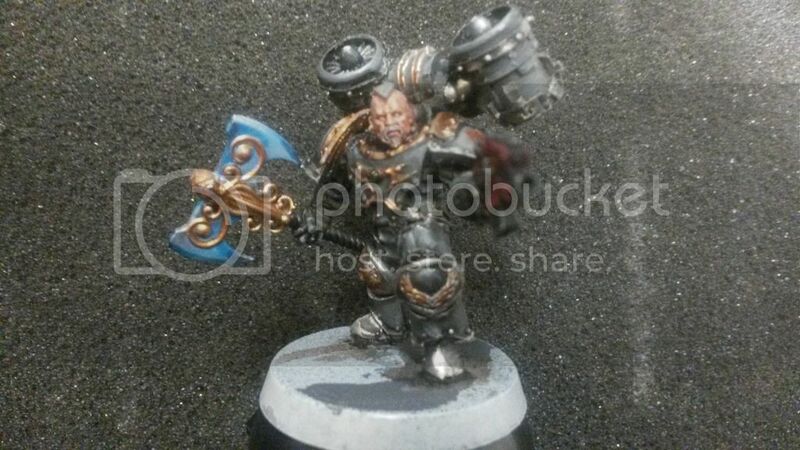 More Night Lords dropped, their armour sundered by blade and bolt. Kjaran, Kassill, Skjara Redwolf and the Wolf-Blade began to reap a tally of cut threads forcing the Night Lords to breaking point. Some of the skitja stayed and fought, then died. It allowed the leader and his party to retreat towards the relative safety of an outlying building and from there, to make a stand. The safety was just an illusion however as Fafnir led his terminator clad pack into their midst. Where, before, there had been a solid wall, now it became a pile of pulped rubble. 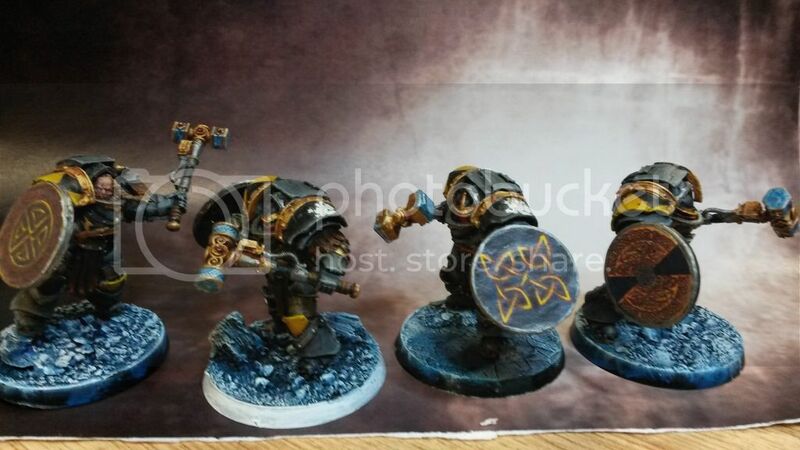 Fafnir and Starkadr burst through, shields to the fore and hammers swinging, followed on by the remaining 3 warriors of their pack. All hell broke loose for a few brief seconds as the Night Lords tried to recover from the turn of events. However the truly smart ones turned and fled before their armour was caved in By Fafnir and his Hearth-Hammers. As the two remaining Night Lords fled the scene, one collapsed in a heap, careening head-long into a fragile cart demolishing it, the second rounded the corner and was away. It was at that point I called Kjaran’s pack back from trying to pursue. We didn’t want to get too strung out and picked off ourselves. We had already lost a lot of brothers that way. The little Lordlings may not have our heart for battle, but they do have a cunning which should never be under estimated. Seeing Kjaran’s pack give up the chase, and watching the one Night Lord slip through his grasp, Fafnir flew into a terrible rage, like a baresark of old times… In truth I feared for my safety in that moment. He stormed over to me and there we were. Face to face. Kjaran's assault team created a cordon around myself & Fafnir, keeping my pack out and his pack away. “One of Curze’s night cursed sons slipped away” Fafnir was getting dangerously an I could scent the kill urge on him. “Torvald, did we let the scum get away?” I called calmly over my shoulder, never breaking eye contact with Fafnir. “Our bolt rounds were envenomed Jarl Agvald… The one who fled, I wounded him myself. His wound will not heal and we can follow his blood trail back to the vipers nest”. “So you see Jarl Fafnir, he hasn’t escaped at all. In fact he is doing something that no amount of interrogation would have given us”. I think I even managed to grin back at him, for his face twisted in frustration as he turned away. “We lost a wolf to set up this trap, that hunters blood will be on your hands Agvald” grunted Fafnir as he gestured towards the fallen man who had led the Lordlings into our trap. I believe he was trying to find a way to save face in front of his men, it was a shock to him when I told him who the dead wolf really was. “That is neither a Wolf or a Hound, but a blood-mad butcher, Jarl Fafnir. 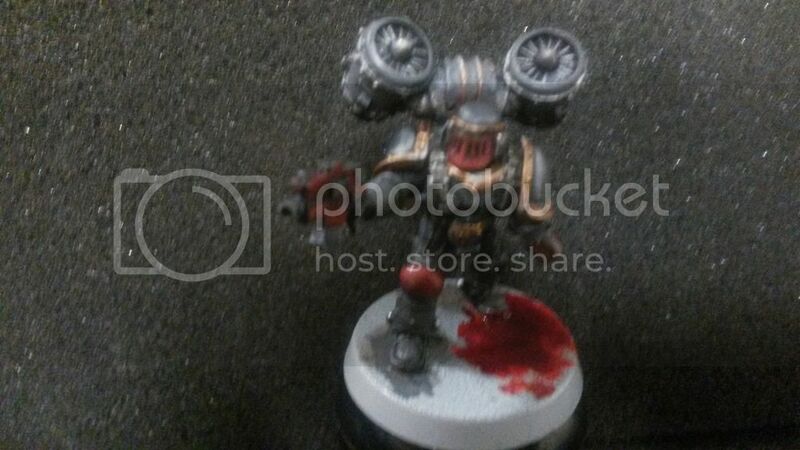 The World Eater was too far gone to give us any information, so we cut out his vocal chords and dumped him in traitor territory near a known Night Lords outpost. He knew where we were for we told him, and we knew he would come here looking for a fight. Apart from Hamma’s hand, we didn’t lose anyone”. “I did roared a voice from the edge of the circle and as one we all bowed”. Korianna was one of the 500 or so worlds which made up the Ultramar sector of space. It was a forge world supplying men and materiel to the ever expanding great crusade. Not a major world, it was however famed for having a Knight household standing over the world as protectors. The ultimate fate of the Knight household is unknown, but from archived records it would seem that a coup of sorts took place and like on many worlds across the Imperiumt, the Knight household was ravaged by civil war. It was around this time that the Word Bearers, Night Lords and World Eaters descended upon Korianna and despoiled this once verdant and productive world. A Space Wolves contingent was sent out to the world shortly after, believed by the Ultramarines to be one of the much-maligned watchpacks. 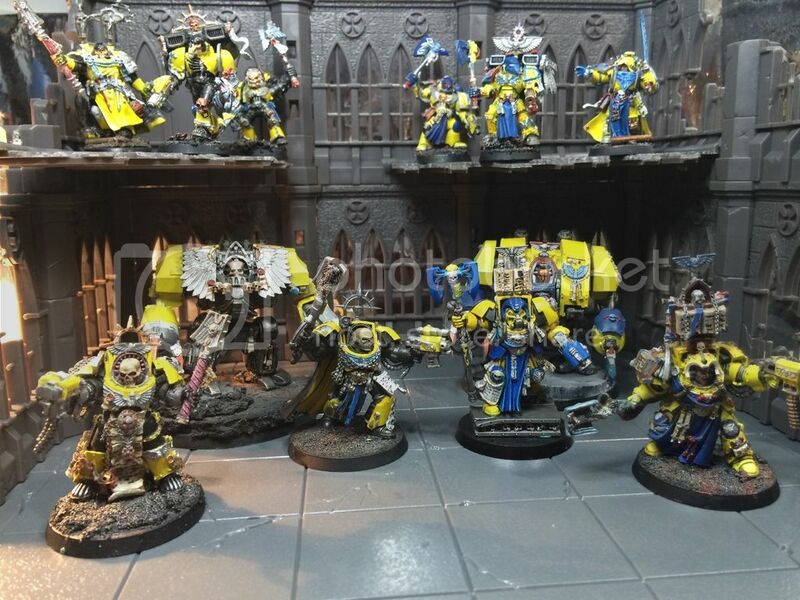 Having ascertained that Lord Guillemann was indeed loyal to the Imperium, they were released from their duties and deployed to Korianna, to monitor the traitor incursion. The total strength of the force which actually deployed, was and still is unknown, however it is fairly safe to assume that it was well beyond the 10 man unit initially sent out. 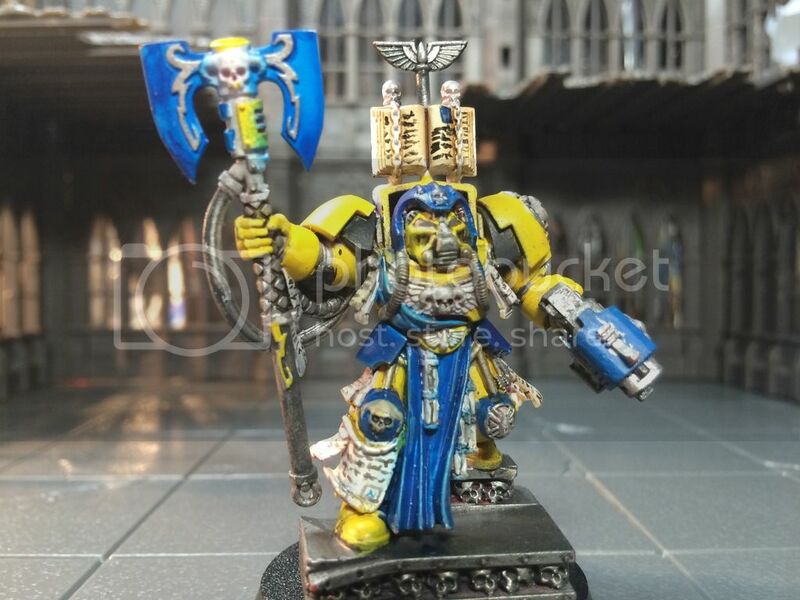 In these uncertain times it is suspected that the Ultramarines allowed the Space Wolves to act autonomously and if they were halting incursions into Ultramar then they were left free to act as they saw fit. 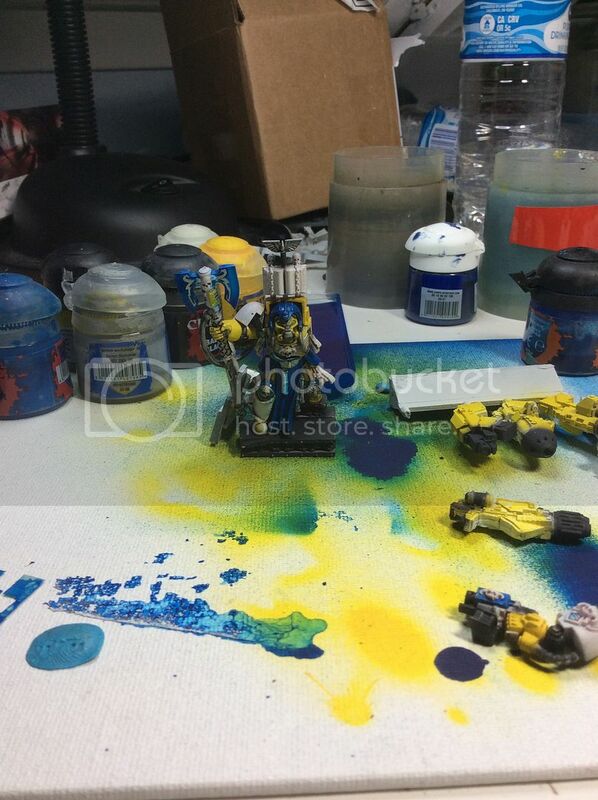 In and of itself, this unusual display of leniency on the part of the 13th Legion shows just how stretched the Ultramarines had become by the unfolding treachery enacted upon them. Once the trap was initiated, fast moving units would descend upon the foe to cause confusion, in this case it was Kjaran Coldhearts assault squad, the "Ice Blades"
From markings and armour types seen on the individual members we can tell that, they have come from several packs. In the first image we can clearly identify mark 3 and the composite mark 5 plate being used. Kjaran is bearing the mark of Vaerangi on his kneepad to display his seniority over the Wolves in his charge. When his pack was not ravaged by attrition, they bore the moniker the "Ironsides". This was due to their famed use of mark 3 armour and being at the forefront of each engagement. The anvil upon which their opponents were broken. This image is of an "Ironside", known as the Wolf-Blade. Clearly displaying the former pack marking on his kneepad. Initially they lost very few packmates further cementing their Ironside reputation, however as teh siege ground on, losses began to mount and packs were amalgamated to keep them at fighting efficiency. Known for ranging ahead of the main force and found where fighting was fiercest. It is believed that Baresark squad suffered as high a rate of casualties from the wolf-curse as from the enemy. 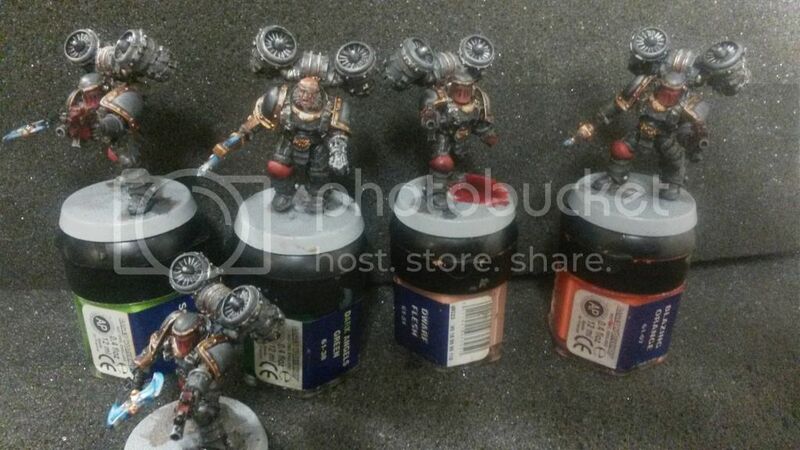 "Iceblade" pack is also made up of mark 2 marines displaying the markings of the pack formerly called the "Stalwarts". A group of veteran assault marines who had fought side-by-side for decades, they gained their name for being ever present and always holding when situations seemed lost. While some wore their veterancy in he form of augmetics gained through injury in war others displayed it with honour plates or upgrades to their armour, such as seen here born by the warrior known as Kassill.